ATLANTA, GA--(Marketwired - Nov 13, 2015) - Simeio Solutions, LLC today announced it ranked 256 on Deloitte's Technology Fast 500™, a ranking of the 500 fastest growing technology, media, telecommunications, life sciences and energy tech companies in North America. Simeio Solutions grew 287 percent during this period. Simeio Solution's chief executive officer and founder, Hemen Vimadalal, credits his company's focus on the market's increased demand for Identity and Access Management as a core requirement for enterprise security and risk management and Simeio's differentiated offering with its industry-leading Identity Intelligence Center™ with the company's 287 percent revenue growth. He said, "For commercial enterprises, governments and communities alike, Identity and Access Management has become an executive-level concern. With numerous high-profile security breaches making headlines over the last several years, a growing number of organizations have come to realize the enormity and complexity of this challenge and the costs of getting it wrong. This has, in turn, fueled the growth of Simeio as these organizations seek expertise and solutions such as our Simeio identity Intelligence Center™ that are required to get it right," said Vimadalal. "Simeio Solutions provides the only true end-to-end, proactive solution to operate, monitor and defend our customer's assets and information while providing actionable business intelligence. We are very proud of what we have achieved for our customers and honored to be recognized among an elite group of companies." "Through the efforts and utilization of new and emerging technologies from these companies, we are witnessing greater business demands from across almost all industries," added Jim Atwell, national managing partner of the emerging company practice, Deloitte & Touche LLP. "We look forward to the opportunity to serve these companies as they strive to grow to the next level -- be it towards introducing new solutions or entering new markets -- and with it make important and long lasting impressions on the technology market as a whole." 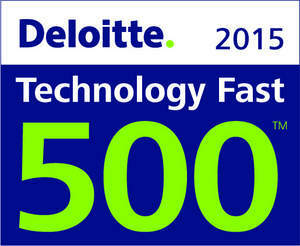 Deloitte's Technology Fast 500 provides a ranking of the fastest growing technology, media, telecommunications, life sciences and energy tech companies -- both public and private -- in North America. Technology Fast 500 award winners are selected based on percentage fiscal year revenue growth from 2011 to 2014. Simeio Solutions, LLC, offers complete, end-to-end identity, access management and security services and solutions, including Identity-as-a-Service (IDaaS), expert managed services, and professional services (strategy and implementation). Simeio's industry-leading technologies include its groundbreaking Simeio Identity Orchestrator™ (IO) platform, designed to simplify the operation of complex, multi-vendor IAM and security infrastructures, and the Simeio Identity Intelligence Center™ (IIC), the first and only solution designed to protect corporate resources and information by monitoring the use of digital identities and access privileges, and leveraging that information to deliver actionable business intelligence. Simeio is headquartered in Atlanta, Georgia with offices around the world. To learn more about Simeio Solutions visit simeiosolutions.com.